the chapter on brain-body connection, for the second edition of Integrative Body, Mind, Spirit Social Work: An Empirically Based Approach to Assessment and Treatment, is now available online. The chapter outlines how the brain and the mind interact with and create each other. The text for “Integrated Body Mind Spirit Social Work,” a Master’s level course at Ohio State University, combining Eastern and Western treatment perspectives. Ms. Palay, a lecturer for the university, has taught sections of this course regularly since its debut in 2010. 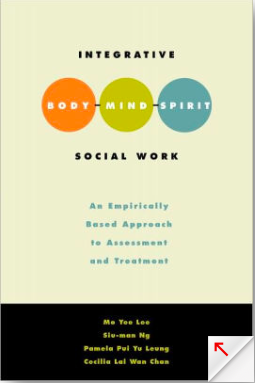 Integrative Body, Mind, Spirit Social Work: An Empirically Based Approach to Assessment and Treatment, 2nd Ed. by Mo Yee Lee, Siu-Man Ng, Pamela Pui Yu Leung, Cecilia Lai Wan Chan, and Pamela Leung, Oxford University Press, USA, 2009. Click here to Lara's article. Click here to the book. Aldridge Palay presented a webinar, jointly hosted by the American Network of Community Options and Resources (ANCOR) and the National Association of Dual Diagnosis (NADD). The webinar was held on Wednesday, February 14th. To learn how to access the archived presentation, click here.